PRICE, Utah, January 30A coal miner was killed at the Aberdeen mine near here yesterday, Sunday, around 11 p.m. The miner, Shane Jacobson, was working at the longwall face of the mine when a piece of coal blew out and struck him, the company told the Salt Lake Tribune. Andalex Resources Inc. owns the mine, which is nonunion. Operation of the mine has been temporarily suspended. In 2004-2005 the Mine Safety and Health Administration (MSHA) cited the Aberdeen mine for 327 safety violations. MSHA classified 184 of these infractions as significant and substantial. The next issue of the Militant will feature first-hand coverage of this incident, which brings the death toll in U.S. coal mines to 16 in the first month of this year. Conveyor belt runs coal into the Rum Creek Coal Plant (above), the tipple for Alma No. 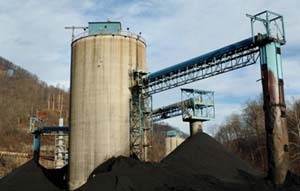 1 mine in Melville, West Virginia. Two miners died underground there after a conveyor belt caught fire January 19. Alma miner Billy Mayhorn (right) hugs his wife Sharon, after emerging from the mine. Mayhorn was one of 19 miners who escaped the fire. The mine is owned by Massey Energy, the fourth-largest U.S. coal company. It was cited for more than 200 safety violations in 2004-05 by the Mine Safety and Health Administration.